Black Star Riders are preparing to enter the studio next month to begin work on a new album following a change in the band’s lineup. Earlier this fall, guitarist Damon Johnson announced his plans to exit the group this month to concentrate on a solo career and session work, and the band are ready to move forward with some new music. 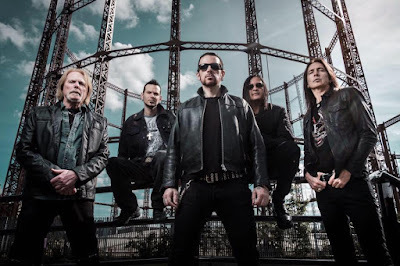 “We go into the studio in January with the new boy Christian Martucci from Stone Sour who we’re absolutely delighted to have as part of our family,” frontman Ricky Warwick tells Planet Rock. “We’ve already demoed 16 songs and we start with Jay Ruston producing the album and we’re going to record in LA, so it’s a change all round because obviously we used Nick Raskulinecz for the last two records, which was great. The 2019 project will mark the follow-up to 2017’s “Heavy Fire”, which hit No. 6 on the UK charts. Johnson performed his final show with Black Star Riders at The Corporation in Sheffield, UK on December 3.